Today we hear of the wonderful miracle that Christ performed in the midst of the multitude that had gathered to hear him and to be healed by Him. 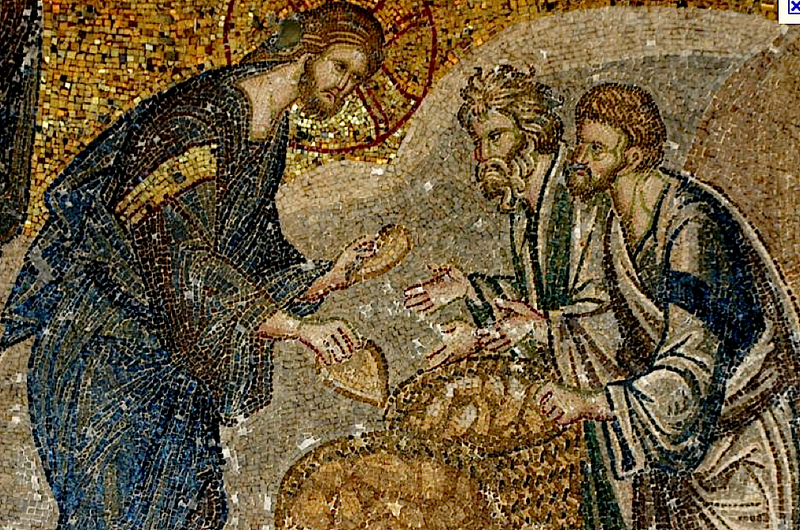 The miracle of the feeding of 5,000 with the five loaves and two fishes. It is a wonderful miracle that shows us the depths of Christ's compassion for us and what he expects of His followers. Many of you will remember that in our Russian Tradition that the priest will consecrate and use five prosphora in the preparation of the gifts, which we call the proskomedia. This practice is to remind us of this very miracle and of the charge that is given us by Christ to be faithful and to make use of that which He has given us to feed His sheep. In the Gospel we are told that the multitudes of people saw Christ and they came by the thousands! They showed great faith even as he was departing. Blessed Theophylact of Ochrid and Bulgaria remarked in his commentary on this gospel that the fact that these people had dropped what they were doing and without making any preparations, rushed after Christ is yet another sign of how great a faith these people had. I am reminded of the passage where we are reminded to be ever watchful for Christ's return and that we should be about his work when the time comes. For who would want to be found sleeping when the Savior comes again? These people in this multitude certainly did not wish to miss this opportunity to hear and to be around this wonderworker! For from his lips slipped forth the words of God and from His hands came forth healing and forgiveness. Here we see Christ's compassion for us. For he looked out across the multitude and did not retreat into the waiting boats that were anchored nearby, but he kindled His heart to meet these faithful who had come just as they were to be healed. Dear ones... is there any other way to come to meet Christ? Is there anything that we are doing that would stand in the way of our chance encounter with the Lord? Have we any dead to bury before taking up the yoke of discipleship of our Christ? Will not the dead bury the dead? For here is life eternal in our very presence! Here is the word made flesh that we might touch him and know that He is real and has become one of us that we may become reunited with the Father. The miracle of the feeding of the multitude with just five loaves and two fishes is not one of ostentatiousness or vain glory. It is of compassion and love. For if the faithful followed him into the dry desert places, then how could he who loves mankind do anything other than to care for their need? We are to remember God's customary love and care for mankind. To Noah in the Ark, he sent a dove... to those who followed Moses into the wilderness, he sent food from heaven. To a dry and thirsty land he sent the rains. And as we will see in the passion of our Lord, He sent his only son to be the lamb that is sacrificed once and for all time for our sins. Here the five loaves become the food for the multitudes. And there is plenty to go around for the masses, so much in fact that no one goes away hungry and there is plenty in reserve left over. This is an archetype of the inexhaustible grace of God towards us and his ability to forgive us far beyond our propensity to sin against Him. In God's love we find a vastness and a depth that surpasses understanding. We perceive the profundity of the Father's care for us by His willingness to perform the seemingly impossible to meet our own overwhelming needs. You see, a miracle is nothing more and nothing less than God casting aside all of the known laws that seem to govern the universe to accomplish that which is most necessary for those that need it it the most. With such a feat as this, we are to be reminded that to us that are given much, much is expected. We are to live an uncommon Faith. We are called to do that which is seemingly impossible, even better yet... we are called to be as Christ by not sending those who are in most need away. Christ did not abandon the multitude that had followed him into the desert. He cared for them as a good shepherd. The disciples did not see beyond their own noses here. They wanted to send the throngs away so they could feed themselves. Christ had other ideas. He said, "You feed them". Not only did He say this but He provided the way forward. You see, God never tells us to do something if He is going to simply say it and not provide the means. To Moses He gave many signs and miracles along the way. Without these miracles, the Israelites would have remained in Pharoah's Egypt. Likewise, when the people come to you with a genuine need, do not simply send them away with a polite, I'll pray for you! Give them of what you have and pray that God will give you more that you may give even more abundantly! Do not take heed of how little you have, but be faithful that God will provide even more that you may have an abundance to give. This is the message of the five loaves! Give until your brother is full and lo, you will see an abundance left over. SUCH IS THE LOVE OF GOD!